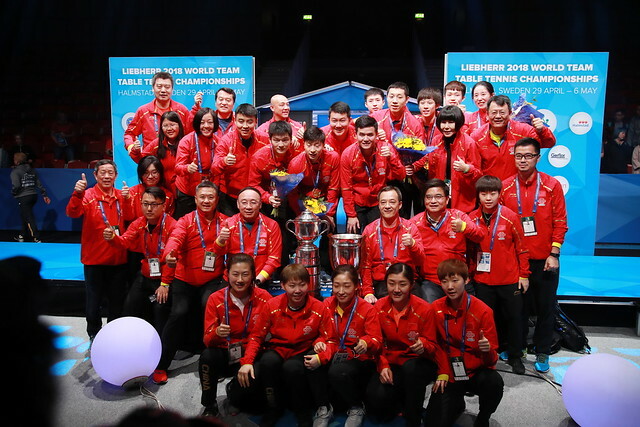 The Liebherr 2018 World Team Table Tennis Championships delivered another exciting day of action for spectators at the Halmstad Arena on Tuesday 1st May as both Chinese teams were tested for the first time and an unexpected group stage blow occurred for the Hungarian women's team. Recap the day’s standout moments with our day three review. Against expectations Hungary won’t feature in the top 12 of the Women’s Championship Division following a dramatic day out in Halmstad for the 10th seeded nation. Narrowly escaping a close shave against USA but Team Hungary’s chances of reaching the next round were dashed in the evening session with a dramatic defeat to Ukraine: Ganna Gapanova was the hero of the tie, registering victories over Georgina Pota (11-8, 11-6, 7-11, 11-9) and Dora Madarasz (11-7, 11-7, 6-11, 11-5) to see the 15th seeds progress from Group B alongside Japan and Austria. Romania moves through as Group C winners following a terrific outing from the European champions. Earning a 3-0 win over third seeds Chinese Taipei, Romania also ended DPR Korea’s unbeaten run thanks in part to Elizabeta Samara, who accounted for Cha Hyo Sim (11-13, 6-11, 11-7, 11-8, 14-12) and Kim Song I (11-3, 10-12, 15-13, 13-11) to guide her team to a 3-2 success. Wang Manyu became the first player for China to suffer defeat in Halmstad; she lost out to Singapore’s Feng Tianwei (4-11, 13-11, 14-12, 14-12) but the top seeds ultimately negotiated the day with two wins to top Group A while Korea Republic took the honours in Group D.
Seeded five positions above their opponents some may argue that Belgium’s win against Belarus isn’t much of a surprise but with the highly experienced Vladimir Samsonov competing at the front of the latter side, the final outcome is somewhat impressive. Vladimir Samsonov prevailed in both of his encounters but Belarus failed to get over the line with Florent Lambiet’s four games win over Pavel Platonov (11-8, 11-8, 9-11, 11-2) handing Belgium the two points. Elsewhere in Group C, England impressively saw off Singapore by a 3-0 score-line while Japan achieved a similar result against Chinese Taipei. Korea Republic picked up its fourth success in a row after completing a comfortable win against fourth seeds France: Lee Sangsu got the ball rolling with a narrow victory over Emmanuel Lebesson (11-9, 5-11, 11-9, 12-14, 11-4) before wins from Jeoung Youngsik and Jang Woojin sealed Korea Republic’s spot in the main draw. Fan Zhendong survived a major scare against Joao Geraldo (8-11, 10-12, 11-8, 12-10, 11-6) in China’s 3-0 victory over Portugal while Brazil also secured its qualification from Group B with a strong outing against DPR Korea. Hosts Sweden will move through to the next round following their 3-1 triumph over Slovenia and a Timo Boll brace inspired Germany to a win against Hong Kong.